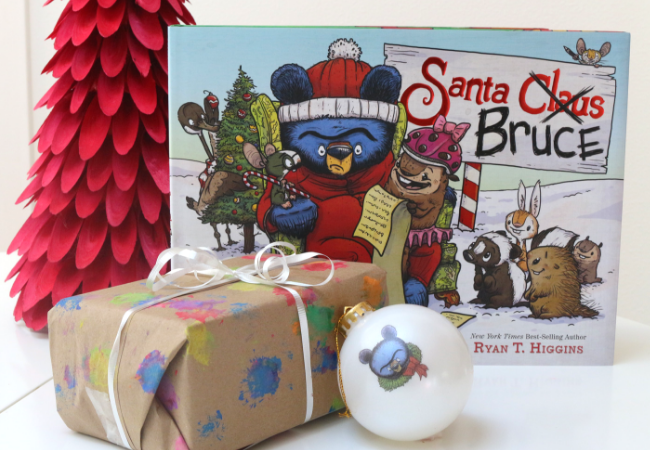 This post about Santa Bruce is presented in partnership with Disney Book Group. This post contains an affiliate link. 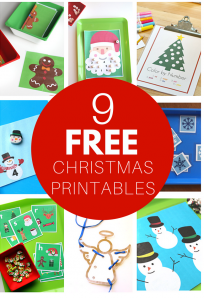 I know the holidays are a long way away, but I see you all searching for holiday craft and book ideas already. 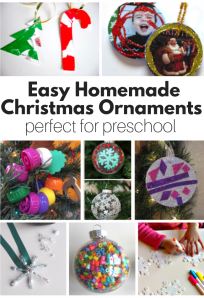 I just had to share this new book and simple craft idea to go with it before we are all knee deep in to-do lists! When you create something useful it makes the whole process more meaningful and wrapping paper is one of my favorite things to make with students. Before we get to the craft let me tell you about this book. Released on September 4th, so it is brand new and it’s hilarious. 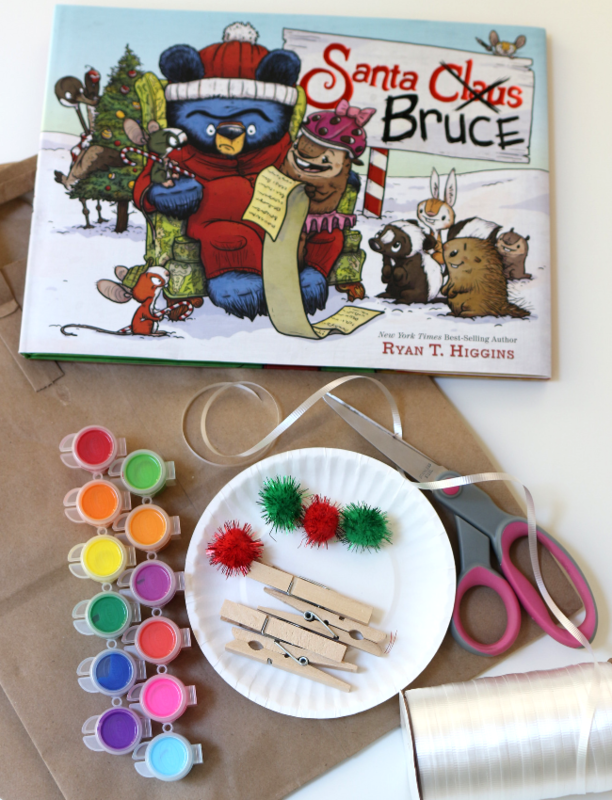 If you are familiar with the other Bruce books by Ryan T. Higgins you know that Bruce is a grumpy black bear who reluctantly does incredibly kind things… he’s kinda like that grumpy old grandpa that is secretly the kindest guy ever. But Bruce is a bear. In this new story, the young animals in the forest mistake him for Santa and start telling him all their Christmas wishes. He humors them but really all he wants to do it go to sleep! The big question is will he play Santa on Christmas Eve for the whole forest? 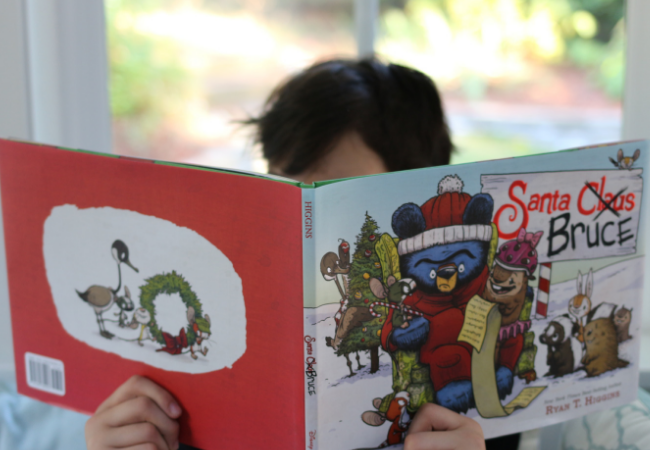 After reading Santa Bruce talk to your students or children about how to get ready for the holidays. 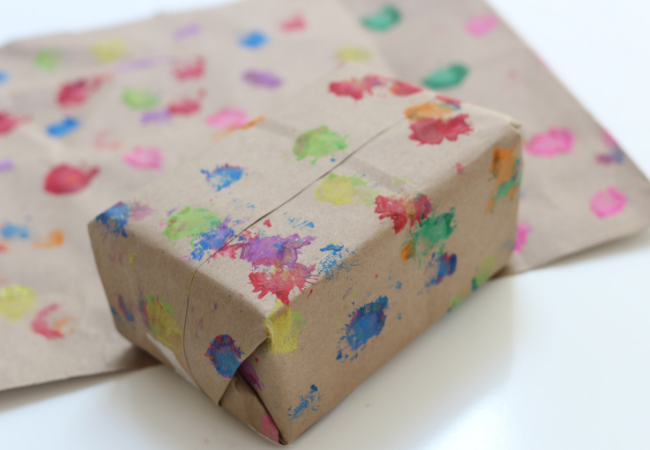 One of the things you need is wrapping paper but you don’t have to buy it, you can make it! 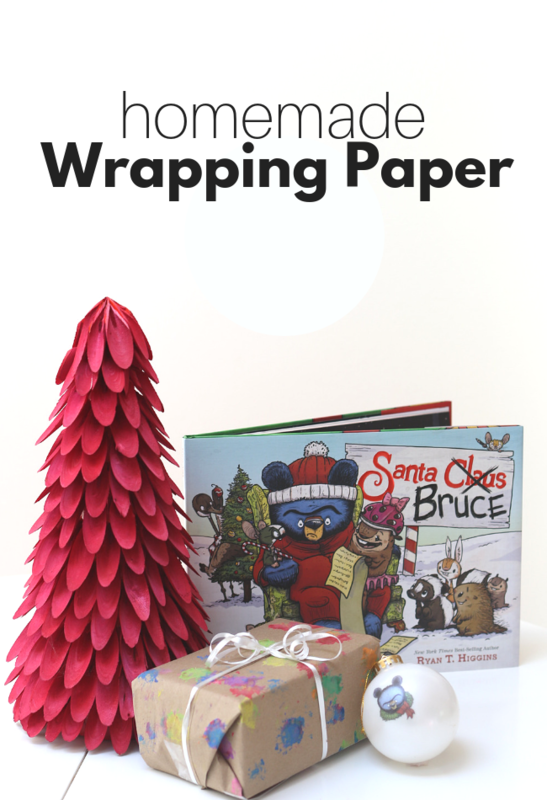 Doing this early is a good idea because you can make a few sheets every time you have a brown paper grocery bag on hand until you have so much wrapping paper you can wrap all your gifts in it. Gather your materials. 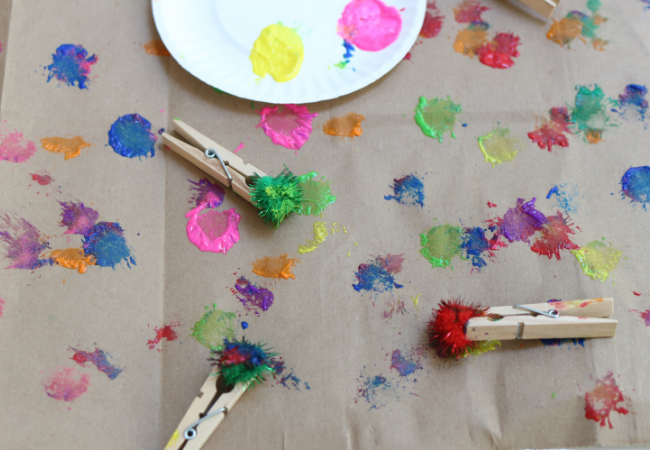 You will need a couple of paper grocery bags ( or craft paper), some pom poms, clothespins, paint, scissors, and some paper plates. 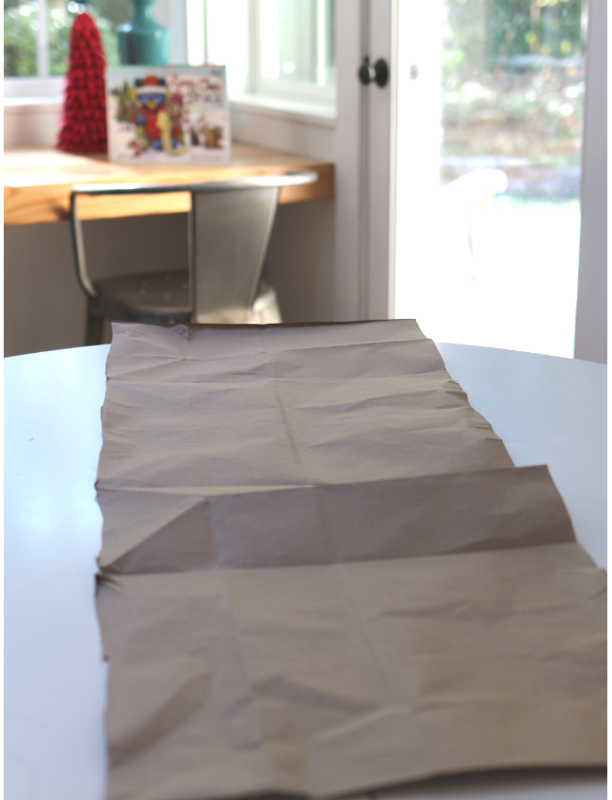 Cut the bottom off your paper bag and layout on your table. 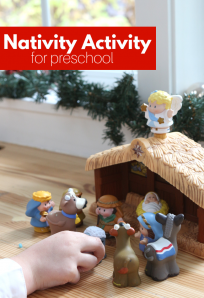 This is a great cooperative art project for preschool, while the art focuses on the process there is a product in the end. 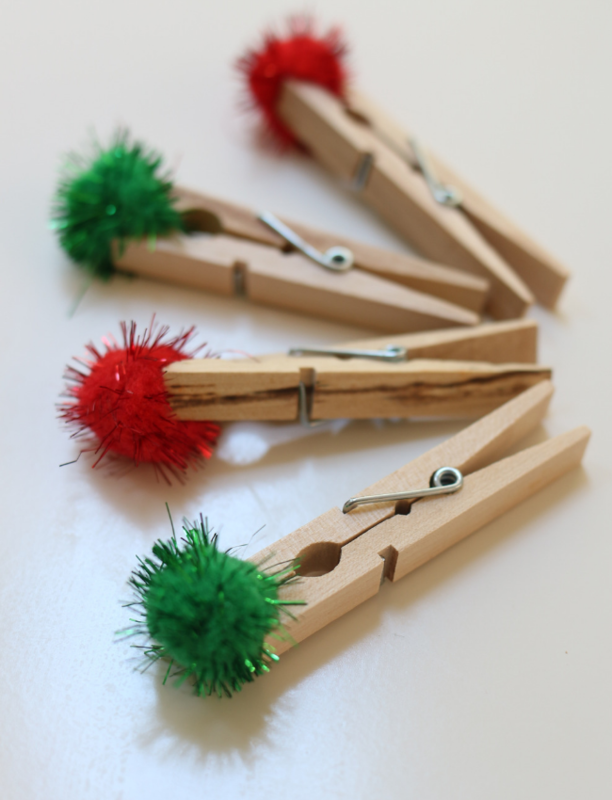 Clip the pom poms onto the clothespins. These will be your paintbrushes. 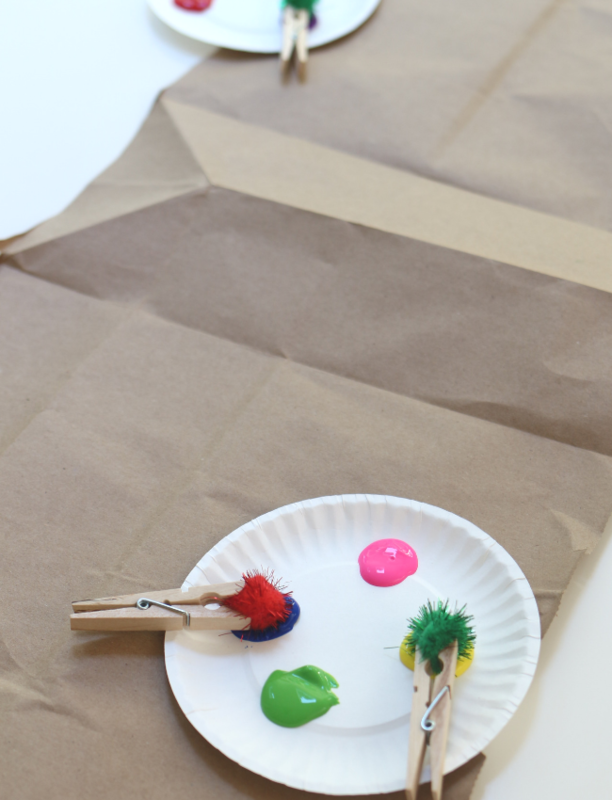 Pour the paint into the plates and place around the opened paper bag. 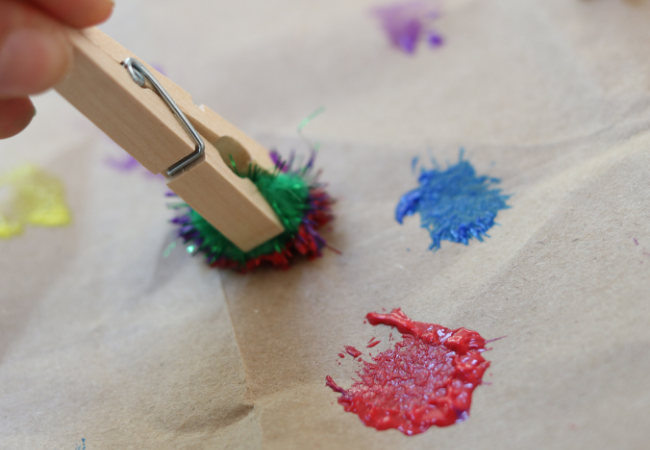 Pop the pom pom brushes into the paint and create! These brushes are so much fun to paint with. While painting you can ask the children if they felt different ways if that would change how they painted. How would they paint if they are happy? What about if they were grumpy like Santa Bruce? Isn’t it pretty? I love it! Let dry and wrap!